Castaway Island has a vibrant tropical rainforest over its 174 acres and is encompassed by pristine beaches, extensive coral reefs and the crystal clear waters that the South Pacific in renown for. The resort on Castaway Island provides all sorts of holiday makers with traditional Fiji style accommodation with a choice of island, ocean view or beach front bures. The Castaway Island is an amazing holiday destination that really caters for families, couples and groups. The local entertainment provides a great place where you can meet other people, whilst the free kids club in ideal for those busy families who just want some time to relax. On Castaway Island there is also excellent dining, great adventures and a range of island activities including swimming pool, snorkelling, diving, bush walking, fishing and much, much more. Castaway Island is situated in the Mamanuca Group of islands which is only 30kms west of the Nadi International Airport. Getting to Castaway Island is easy either via a 1½ hour trip on a South Sea Cruise catamaran or a 10 minute seaplane/helicopter ride which departs from the Nadi Airport itself. 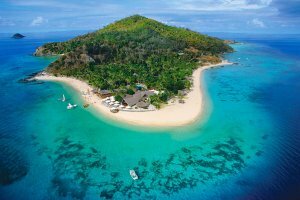 The Castaway Island Resort in Fiji is a private island embodying enverything that is good about the Fijian way of life. This award winning resort includes all of the facilities and leisure activities that you will require to ensure that your holiday in Fiji is a truly relaxing and memorable one. The Castaway Island Resort is one of the most popular Fijian Island resorts because of its white sand beaches, spectacular coral reefs and crystal clear blue waters. Guests at the Castaway Island Resort can try snorkeling, windsurfing, kayaking, parasailing and water skiing, or alternatively relax with an island style massage. If you want hotel and/or resort accommodation on Castaway Island at cheap rates for your next holiday then Holidays Fiji is the place for you. We give holiday travellers the ability to compare a range of hotels, resorts and apartments at the same time, thus making it easier for you to decide where it is that you want to stay. So book your accommodation at any of the Castaway Island resorts with confidence, and even take advantage of the cheaper rates for longer stays.